Samsung Electronics Co., Ltd. today announced the latest addition to its premium Note series with Galaxy Note9. The Note series has been recognized for including the company’s latest groundbreaking innovations, and Galaxy Note9 builds on this legacy with a premium smartphone that delivers the ultimate in performance; a new S Pen with connectivity for the first time ever; and Samsung’s most intelligent camera yet. They need a phone that won’t let them down and Galaxy Note9 delivers. Store More, Delete Less: Galaxy Note9 is available with two internal storage options – choose from 128GB or And with the ability to insert a microSD card, Galaxy Note9 is 1TB ready to have peace of mind knowing there is enough room for favorite photos, videos and apps. Speed and Power: Galaxy Note9 is a super powerful smartphone with cutting-edge 10nm processor and support for the fastest network speeds available in the market (up to 1.2 gigabits per second) to stream and download without slowing down. Now with Bluetooth Low-Energy (BLE) support, the new S Pen delivers an entirely new way to use the Note. With just a click, it’s now possible to take selfies and group pictures, present slides, pause and play video, and more. Developers can even integrate the S Pen’s new, advanced BLE functionalities into their apps later this year. The Infinity Display is the cornerstone of Samsung’s design heritage, and Galaxy Note9 has the largest edge-to-edge display ever on a Note. The 6.4-inch Super AMOLED Infinity Display provides a truly immersive multimedia experience. Galaxy Note9’s Infinity Display is complemented by stereo speakers, which are tuned by AKG, and ability to deliver Dolby Atmos® immersive audio for a life like experience. Mobile video has never looked or sounded better than it does on Galaxy Note9. YouTube named Galaxy Note9 as a Signature Device able to deliver a best-in-class YouTube experience. Galaxy Note9 also delivers a PC-like experience with Samsung DeX. Users can work on presentations, edit photos, and watch their favorite show all powered by their phone. Experience Samsung DeX with easy-to-carry HDMI adapters. When connected to a monitor, Galaxy Note9 can power a virtualized desktop and even serve as a fully-functional second screen. Take notes with the S Pen while watching a video, or use Galaxy Note9 as a trackpad, to right-click, drag and drop, and use multiple windows on a monitor. It’s never been easier to be more productive. The premium Galaxy technologies come standard with Note9: fast wireless charging, IP68 water and dust resistance and Samsung services such as Samsung Health and Samsung Pay. Galaxy Note9 features Samsung’s trusted, defence-grade Knox security platform and biometric security options including fingerprint scanning, iris scanning and facial recognition capabilities to keep important information safe. Galaxy Note9 opens up a world of possibilities – it’s a portal to the full Samsung ecosystem of devices and services. For instance, use Galaxy Note9 and SmartThings to control connected devices, or get more done with Bixby, a personalized, intelligent assistant. And with the launch of Galaxy Note9, Samsung is making it easier to enjoy music with a new long-term partner, Spotify. The partnership makes Spotify easily accessible to seamlessly sync and transfer music, playlists and podcasts across Galaxy Note9, Galaxy Watch and Smart TV products. 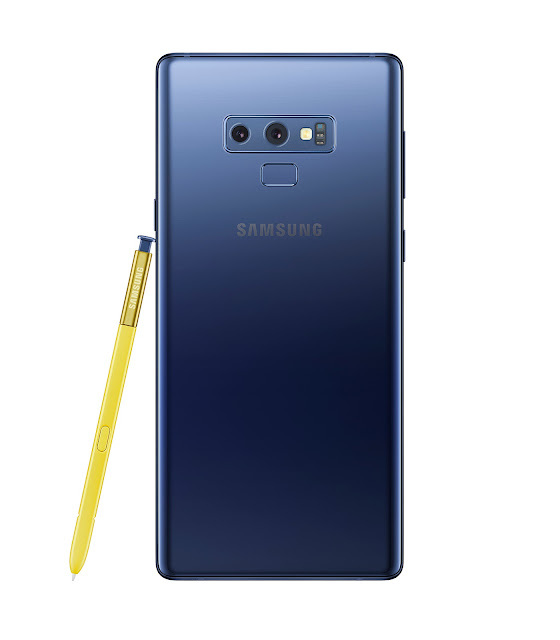 Galaxy Note9 will be available starting August 24, 2018 in select markets and will be offered in Midnight Black, Lavender Purple, Metallic Copper with matching S Pen, and Ocean Blue with a Yellow S Pen. Samsung inspires the world and shapes the future with transformative ideas and technologies. The company is redefining the worlds of TVs, smartphones, wearable devices, tablets, digital appliances, network systems, and memory, system LSI, foundry and LED solutions.